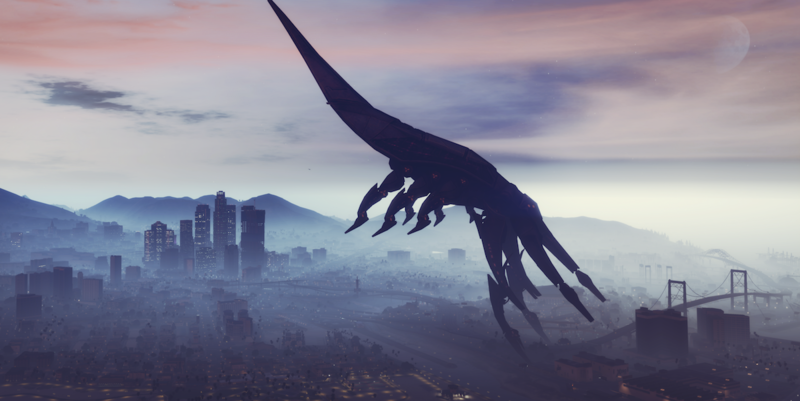 It's a mod, mod world when a universe-destroying Reaper from the Mass Effect series invades Grand Theft Auto V's Los Angeles stand-in, Los Santos. What you see up above is the result of Flickr user berdu applying the pretty self-explanatory "Mass Effect 3 Reaper as Blimp" modification to the PC version of Rockstar's stick-up simulator. It looks awesome and there's video of it in action after the break. As creator JJxORACLE writes on the (currently in beta testing) tweak's download page, sometimes the vanguard of our destruction will disappear from the skies completely and there doesn't seem to be any collision detection here. Oh, and its legs can touch the ground while it moves every now and again, because, you know, it's replacing Los Santos' legless blimp. Berdu's Flickr page is rife with awesome screenshots (including fighter jets attacking this monstrosity) for all sorts of games, so give it a look. Oh, and let's just hope this doesn't follow suit with other airborne mods and install malware. I mean, it is a Reaper, after all.